The story of the Egyptian revolution is being written collectively, and cinematically, by the Egyptian people. During the sit-in in Tahrir Square that started on July 8, 2011 — a protest against the slow pace of government reforms under military leadership — a screen made of wooden planks was erected to display videos of the revolution. This open-air movie theater, dubbed Tahrir Cinema, showed everything from finished documentaries to raw footage. And taking a page from the web 2.0 playbook, it was a collectively curated endeavor; anyone with video could put it up on the big screen. Egyptians are debating the value and quality of video documentary as part of the Egyptian Revolution. A recent article from Egypt’s English-language news site AhramOnline discusses the spate of documentaries that have been produced, both during and after the uprising in Tahrir square that captivated the world — in part through the deft use of online media. The article touches on a number of issues, including questions of industry and international pressure, but my interest was sparked by it’s comments on the quality and artistic merit of some of these documentaries. For me, this debate touches on one of the core tensions at the intersection of art and organizing. With video technology so close at hand, often in the form of mobile phones, the Egyptian revolution was televised — or at least YouTubed. Almost immediately, amateur and professional documentarians began to assemble footage into movies that could tell the story of the revolution and its aftermath. 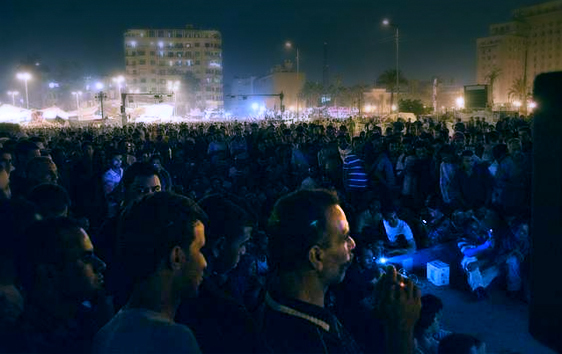 During the revolution, a cinema was constructed right in the middle of the Tahrir square, showing raw footage of the revolution to those protesting. Once the initial revolt was over, both local and international film festivals have sprung up to feature documentaries of the revolution. So documentary footage, and documentaries, have been important parts of the uprising — bringing people together, sparking dialogue, spreading the word about the revolution, and seeking to shape the story of the revolution rather than leaving it to television’s talking heads. It may be easy to dismiss some of these concerns as artistic elitism. Rough, quickly crafted documentaries fresh from the ongoing struggles perhaps have their own kind of aesthetic even more appropriate to fast changing times. The video above, for instance, captures a sense of excitement, of power, and of collective vision. But it does not reach the kind of deep understanding and powerful narrative that the best documentaries offer — that is likely not the artist’s goal. As someone passionately committed to cultural organizing, I’m the last person to argue that the goals of art and activism are opposed. The reason this work is so powerful is because the goals of organizing and political art can compliment each other so well. But we still need to be aware of where the tensions lie, particularly because the moments when artistic quality is sacrificed for political expediency are, in my experience, the moments where artists become skeptical. They are often frustrated by a sense that art is used and abused as a tool for purely political ends, without a real appreciation for its intrinsic power. The tension in the Egyptian documentaries, I think, revolves around time. Quality film-making — film-making that has the potential to change the way people see the world — usually takes a lot of time. This is not just an aesthetic point: as cultural organizers, higher quality can mean more effective. Normally this is not a problem. If a cultural organizing group takes on an issue that is ongoing and constant — say, creating documentaries about the corruption of a regime in power — they have some freedom to take the time they need to craft their message, medium, and story just right. But what about in times of fast-moving change? Decisions are made quickly, situations are shifting under our feet. Sure, in a year or two fabulous documentaries will be made culling truths from the past. But what is the cultural organizer’s role right in the middle of the action? I’ve more questions than answers, but I will leave you with a more recent video by Jasmina Metwaly, this one perhaps showing how the has changed as the revolution has moved into a new stage.